In 1771, contractor Benjamin Powell was appointed to began construction on the public hospital. The public hospital was a two-story brick building south of Francis Street. A fire in 1885 destroyed the original 1773 hospital building, which included a central hall leading to the keeper's quarters and the patient cells. A central staircase led to the room in which the court of directors held their meetings, as well as to more patient accommodations. Before he was finished, Powell was also directed to add outdoor "yards for patients to walk and take the Air in" and to "put a fence around the lot." The first patient was admitted to the public hospital on October 12th, 1773. The hospital's maximum capacity was 24 patients, a number that was not reached until the early 1800s. The public hospital showed aspects of both jail and infirmary in its design, expressing the increasing fear of social deviants occurring at that time. There were three people originally staffing the public hospital: a keeper, a matron (for female patients), a physician, and a few slaves to care for the daily upkeep of the hospital and its patients. The keeper of the hospital was James Galt, and his wife was the hospital matron. In 1841, the name of the public hospital was changed from The Public Hospital For Persons of Insane and Disordered Minds to Eastern Lunatic Asylum, carrying with it the connotations of a sanctuary for the mentally ill. Also in that year, a third story was added onto the main building. The gaol-like positions of superintendent and matron were replaced with the position of superintendent. The superintendent was a resident, full-time doctor and head administrator to the hospital. The superintendent in 1841 was John Minson Galt II, who made sweeping changes in the management and care of patients. At his death in May of 1862, the hospital housed between 200 and 300 patients in its 7 buildings. 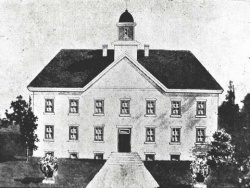 In the 1850s, Superintendent Galt suggested a day-patient approach similar to the town of Geel (present-day Germany), where patients went into town and interacted with the community during the day and returned to the hospital at night to sleep. The Court of Directors rejected this proposal. The idea was a century ahead of its time and re-emerged as de-institutionalization in the 1900s. However, Dr. Galt did carry out an experiment with de-institutionalization in Williamsburg that lasted for a decade. Convalescing patients who behaved well and had good self-control (approximately half of the 280 patients at the time), had the freedom of the town at all times during the day. The townspeople were also encouraged to visit and socialize with patients still confined to the hospital grounds. Many of these changes were a part of a new era called "moral management," brought about due to a change in social perception of mental illness. Many changes to Eastern State Asylum occurred at this time. The asylum, as well as the surrounding area, was captured by Union troops on May 6th of 1862. John Minson Galt II, superintendent for 21 years, also died that month. With the capture of the city, all but one of the white attendants had fled. The 252 patients had been left, locked in their apartments to starve. The remaining attendant, Sommersett Moore, handed the keys to the hospital to the Union army and saved the lives of the patients. A great many changes occurred during the next 23 years, to both the administration of the hospital, and to the size of its population. Superintendents did not always have the full support of their staff or the Court of Directors, and the hospital did not always receive adequate financial support. In 1876, fire destroyed one of the asylum buildings. One superintendent, Dr. Harvey Black, was inspired by Dr. Galt's manuscripts to try and deinstitutionalize some of the 400+ patients at the hospital in the late 1880s. He was fired by the court of Directors and replaced by Dr. Richard Wise, whose goal was to find space within Eastern State Asylum for as many "unfortunates" as possible. Under his supervision, the population of the hospital rose from 323 to 447 patients. At this time, there were 10 buildings on the Eastern State Asylum property. A few of the therapeutic activities introduce by Galt still continued, but for the most part the hospital became a long-term care facility for the chronically ill.
After the Civil War, there was an increasing lack of confidence in the ability of science to cure mental illness. Though mental illness was believed to be hereditary or of physical nature, the problem of its cure defied scientific solution. The hospital became crowded with the chronically mentally ill, and the number of patients successfully cured declined. Admission to the hospital was on a first-come, first-serve basis, regardless of chances for successful treatment. During the era of custodial care, the goal became not to cure mental illness, but to provide a comfortable environment for the mentally ill, separate from society. Recreational activities such as dances, steamboat excursions, and tea parties were offered to patients, as well as magic lanterns, a stereopticon viewer, and checkerboards. The use of restraints, in the forms of straight-jackets and Utica cribs (mesh boxes to confine the violent and unruly), were also reintroduced during this time. On June 7th in 1885 on a Sunday evening, a fire destroyed the original 1773 hospital building. The nearest fire engine at the time was in Richmond, some 50 miles away. Students from the nearby College of William and Mary came to the assistance of the hospital staff to help put out the fire. By the time the fire was out, five other buildings in the asylum complex had burned down. The fire left two patients missing (presumed dead) and 224 other patients displaced. Electrical wiring for lighting, one of the improvements made to Eastern State Asylum during the superintendence of James D. Moncure, was suspected of sparking the blaze. In 1894 the hospital was renamed from Eastern Lunatic Asylum to Eastern State Hospital. By 1935 Eastern State Hospital housed some 2000 patients with no more land for expansion. The restoration of Colonial Williamsburg and the Williamsburg Inn surrounded the facility with a thriving tourist trade. A proposal was made to move the hospital to Dunbar Farms, located west of the city on Ironbound Road. The first care buildings at Dunbar were constructed and inhabited in 1937. The Dunbar Farm land is where Eastern State Hospital stands to this day. Treatment of patients also changed during this time, as effective psychiatric drugs for the treatment of mental illness became available after World War II. The idea of community-based care, a version of which was proposed by Dr. Galt a century prior, was carried out in the 1960s under the name of deinstitutionalization. To learn more about the current treatments available at Eastern State Hospital, click here or return to the homepage to browse. When the move from Francis Street to Dunbar Farms was completed in 1960, the old asylum complex was razed. In 1972 the original public hospital building was excavated. The debris from the 1885 fire had merely been shoveled into the remaining foundations, and various small items such as glass were recovered. In 1979, Colonial Williamsburg received approval to reconstruct the old hospital building, which was opened to the public in June of 1985. Today, the reconstructed building houses a public hospital exhibit, staff offices, and serves as an entrance to the DeWitt? Wallace Decorative Arts Museum. The Eastern State Hospital Cemetery is but a short distance from the original Hospital location. Patients who died were buried here, but all were laid to rest on unmarked graves, thus the cemetery for the most part is just a piece of well kept land. It has wrought fence on the front of the cemetery, and immediately upon entering the gate there is a monument area that was erected in 1986, consisting of five granite stones with the theme "CELEBRATING THEIR DIGNITY". The following words are inscribed in one of them:"We erect this monument in memory of those persons whom we have known, loved and served through the years. While living they knew the suffering of inner pain, confusion and despair. Now they are at peace in the hands of God where no torment will ever touch them again". On the other four stones, the names of all laid to rest are inscribed, over 1,200. They are not alphabetized nor does it show any dates. There are only about half a dozen old stone markers in the cemetery, and on the last few years, simple stones with names and dates are noted by the fence area. This page was last edited on 31 October 2015, at 10:56.